221 p., 14,7 x 20,8 cm. With contributions by Isolde Böhme, Claudia Frank, Johannes Picht, Gerhard Schneider, Victor Sedlak, Martin Teising, Sylvia Zwettler-Otte and Ralf Zwiebel. 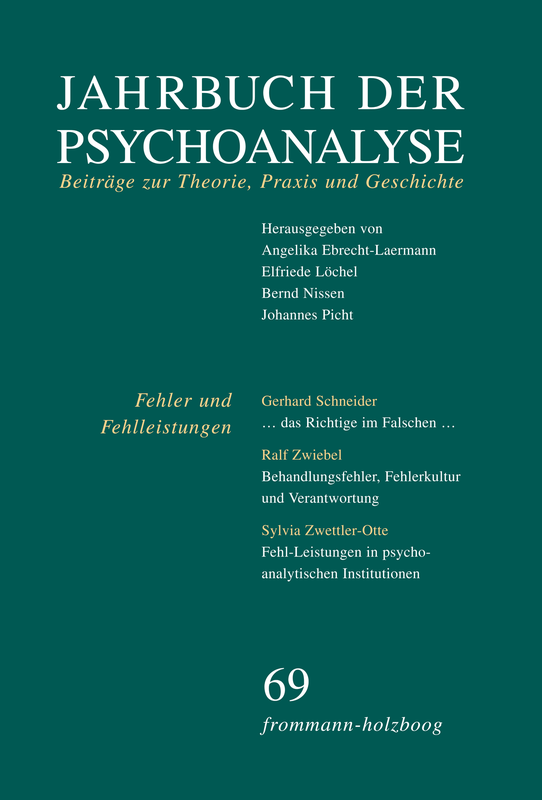 In the context of misapprehension, mistake and failure as unavoidable phenomena of psychoanalytic practice, the author distinguishes two different areas: General standards of professional activity relating to psychoanalysts as well as other professionals belong to the first area. Professional malpractice, which is within the range of this area, is solely the analyst’s responsibility. The second area refers to the specific method of psychoanalytic work being subjected to the dynamic of success and failure in the analytic couple. In this area, the author argues, a culture of error tolerance ought to be developed, the elements of which are described. Only in this area does it make sense to talk of shared responsibility. The ethical ban on the exploitation of dependence, valid for all therapeutic professions, can be set apart from a specifically psychoanalytic abstinence aimed at the manifesting and working through of transference. The latter, however, is ethically founded as well, its ethics deriving from what psychoanalysis is destined for. This is rooted in modern subject philosophy, as formulated by Kant, but is confronted by Nietzsche’s unveiling of the metaphysical fundaments of the subject as values in disguise and by a concept of life that goes beyond the individual. Freud tries to come to terms with this challenge in ›Beyond the Pleasure Principle‹. While the classical rule of abstinence, related to the pleasure principle, asserts individuation and a binary logic, »beyond the pleasure principle« a new ethics is outlined that is no longer binarily orientated towards subject and object, good and evil, true and false, but towards potentiality of innovation. Abstinence, then, would also appear to mean the eschewal of a fiction of guaranteeing certitude and constancy by way of concepts and technical rules. The limitations of psychoanalytic treatment are many: not only is it a slow and expensive treatment but also it is not always as successful as the analyst or the patient would wish. The paper argues that psychoanalysts need to accept this as a fact of their profession – failure to do so will have clinical consequences in that the patient may feel that the analyst cannot face the reality of the clinical predicament. A case from supervision is given as an illustration of this dilemma. A clinical case is then presented in which the capacity to face reality, particularly its disappointing aspects, is the patient’s central clinical difficulty. It is argued that the genesis of this difficulty was in the failure of the early objects to face their own disappointments. The paper describes the analyst’s attempts to come to terms with the frustration and regret induced in him in the analysis and to do so without becoming persecutory to the patient or despairing of his profession. Verdrängte Absichten werden nicht nur in den blitzartigen Entladungen von Fehlleistungen, sondern auch in schleichenden Prozessen wirksam, die hier als Fehl-Leistungen bezeichnet werden. Sie lösen vages Unbehagen sowie korrigierende Wunschphantasien von einer innigen Verbundenheit (»ozeanisches Gefühl«, »facilitating environment«) aus und führen zu (unbewussten) Dilemmata zwischen dem Wunsch nach Zugehörigkeit zur Gemeinschaft und den individuellen Bedürfnissen nach Freiheit. Freuds Schrift ›Das Unbehagen in der Kultur‹ wird als Basis für die Überlegungen verwendet, wie derartige Phänomene auf spezifische Weise auch in psychoanalytischen Institutionen auftreten. Beispiele solcher Fehl-Leistungen sind die Unterschätzung unbewusster Abhängigkeit des Individuums von der Institution als Teil der Persönlichkeit und der Identität aufgrund alter symbiotischer Bedürfnisse; die Verleugnung destruktiver Intentionen, die sich in der fehlenden Beachtung notwendiger individueller Erfordernisse äußern; die Organisation vieler und großer Zusammenkünfte, bei denen gleichzeitig das Fehlen aufmerksamen Zuhörens und echter Diskussionen beklagt wird; imponierende Expansionsbestrebungen ohne Abwägung der damit verbundenen Verluste und das Ignorieren der Bedeutung alter Bindungen (auch der fortbestehenden Übertragung) trotz des beruflichen Wissens um die Erhaltung des Vergangenen im Seelenleben. During the last decade analytical training has been connected with intense efforts to find ways for an exchange about the quality of the candidate’s psychoanalytical work among colleagues. In this process, the three frames introduced by Tuckett have been essential. They structure the common thinking in working groups, e.g. at the conferences on supervision organized by the DPV. The authors put forward their idea that this can and should be linked with a supervision of the supervision.